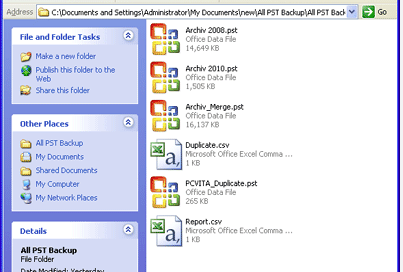 Merge Outlook PST files including email, contacts, calendar, tasks etc. Combine Multiple PST files into one united PST file. Support Splitting of PST file according to Initial PST or Yearly PST. Merge all PST files without 2 GB file size limitation. Allow merging of both ANSI and UNICODE format of PST file. Software allows to merge multiple PST files into single large consolidate PST file of Unicode type. Merge PST tool also support to merge any size and type (ASNI and UNICODE) of PST into single PST. 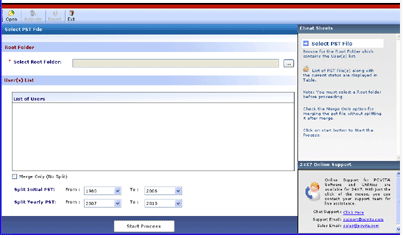 Combine unlimited PST file to single PST file including all data files and folders of PST like email, contacts, calendar, tasks etc. without affecting the integrity of data items. PST merge software will not only combine different PST file but also remove the duplicate data items. The resulting PST file will not contain any redundant data file. 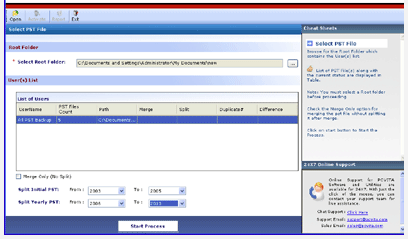 A separate PST file for duplicate data is created by the tool. Merge PST Software support two additional features that split files according to Initial PST, which will generate a single PST for particular year slab and other option is Yearly PST, which will generate one PST for each year. After completion of PST merge process, a complete report summary will be generated that contain information regarding number and name of PST, duplicate items found, merge & split summary. PST merge software ensures that the merging process will not affect the folder structure hierarchy and preserves all metadata (Cc, Bcc, To, From etc.) & attachments of resulting PST file similar to source PST files	. Outlook PST file also is known as Personal Storage Table is created when a user configures IMAP based email account with Outlook. 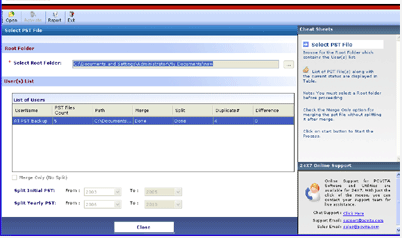 These files consist of emails, contacts, calendar, journals etc stored in separate files and are stored locally on user’s system. This local storage prevents them from mailbox size issue faced on the mail server. Also, these archived PST files are more beneficial when user experience loss of data from the mail server. PST file Location: You can view your PST file by opening Outlook Application>> then right click on respective email account>> finally click on Open File Location. Intrigua’s Merge PST is the best software to merge multiple PST file to a single large PST. 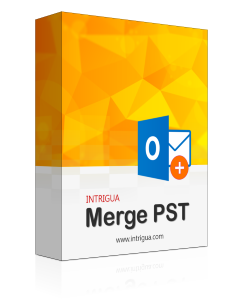 Merge PST supports join of both ANSI and UNICODE PST file consisting of data like email, contacts, calendar etc. Also the data integrity is maintained with the advance feature of removing the duplicate data items during PST merge. The reason behind using merge PST tool is that it will help you manage numerous PST file on your system. When limited space is available to store multiple PSTs then combine PST file is the only option to make sure that no space is wasted. Step 2: Browse to select PST files. Watch Merge PST software video to quickly assimilate with the functionality and working of PST merger tool. This interactive video contain an overall sequence that will guide our user in the right direction. Does Merge PST Software supports latest version of windows? Do I need to close MS Outlook to perform merging process? No. It doesn't affect merging process, whether the MS Outlook is closed or opened. Can I merge large number of PST file? Yes. You can merge any number of PST file using Merge PST tool. Does this Software automatically recognize PST files in a particular folder? Yes. Merge PST software will automatically recognize or load multiple PST files in a particular folder. Does the tool removes duplicate data items or files while merging multiple PST? How much time does it takes for merging multiple PST file? Merging Process will not take much amount of time but the time taken is directly proportional to size of multiple PST files and system configurations. Support MS Outlook version 2013, 2010, 2007, 2003 & 2000 (32/64 bit- Any Version of MS Outlook). Microsoft windows are supported by Merge PST software including Windows 8.1,8, 7, Vista, XP, 2008, 2005, ME, & NT (Any Version of Microsoft Windows). 20 MB of free hard disk space should be available to run Merge PST software. Having worked with Outlook for quite a long time now, I have my data stored in multiple PST files. To make the data accessible from a single file, i wanted to merge all the files together. Thankfully, INTRIGUA Merge PST software helped me in doing the same without data loss. I have data stored in multiple PST files that contains duplicate items. The INTRIGUA Merge PST tool not only helped in combining all the PST files in a single file, but also helps in removing duplicate items from the files before merging. Thanks team for the great work.